Gardening in a small space is as rewarding as it is challenging. These six herbs are chosen because they are not the space hogs some of their counterparts are. For instance, Italian Oregano remains an upright shrub whereas Greek Oregano spreads by runners and quickly takes over a container or small space. Planting in a small garden is obviously different than planting in a container. Plants in a garden have access to more soil than plants in a container do, so they can stay in one place longer. When planting into the ground, it is important to give plants enough space in between to accommodate several years' growth. In each of the plant descriptions below, we give you spacing recommendations for garden planting as well as container size recommendations. When planting in a container, be sure to use high-quality potting soil with organic fertilizer mixed in. Both the plant and the potting soil should be moist before planting. The six plants in the Small Space Garden Collection can be combined in one or more containers. The container should hold about six gallons of soil. Be sure to watch that one of these plants does not crowd out the other. More than likely, this kind of container planting will need repotting at the beginning of the next growing season. Repotting helps your plants avoid becoming root bound. (All plants grown in containers will eventually become root bound.) Plants that are root bound may begin to show signs of stress like yellowing or wilting after they have been in the same container for a while. To discover this before it becomes problematic, check the root zone periodically. If soil is loose when you poke around in it, then the plant's roots still have room to grow. If the soil is hard to penetrate, then repotting is necessary. Repotting can take one of two turns. The first is root pruning. Plants may be root pruned and repotted into the same container with fresh soil. At least one-half of the new container should be new soil. About two weeks before root pruning and repotting, you should prune the tops of the plants you want to repot. Needless to say, this type of repotting takes more skill than just repotting into a larger container and plants can be damaged or die if root pruning is not performed correctly. The second repotting method is to move the plant to a larger container. The new container should be large enough to keep the plant happy for another long period of time. For example, a gallon-size root bound plant can be moved to a three gallon pot. Growing plants outside in containers also means their roots are not protected by the natural warmth of the soil like they would be if planted in the ground. Growing zones indicate the lowest minimum temperature a plant can endure when established in the ground and are listed with each plant. If your zone is the lowest one listed, please take extra care of container-grown plants. This may mean moving them near the house for warmth or into the house if the cold is extreme. Container-grown plants that are kept outside should be monitored throughout the winter for moisture. A dry plant does not tolerate cold as well as a hydrated plant. 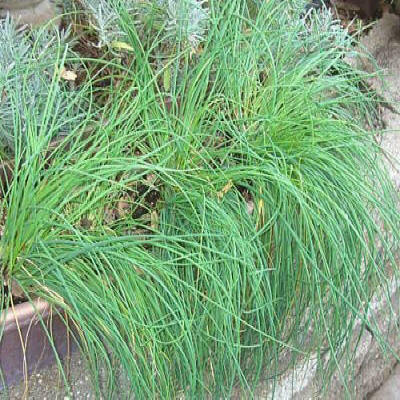 Click on the name of the plant for more on growing and using each herb. Chives are just plain fun. Tasty too. These three pots of chives have been in this window box for two years. They are still pretty happy here but we will divide them soon and give them more space. To divide them, gently remove from their container and separate them into halves or fourths by teasing them apart. (It is easier to do this when they are very wet.) Put three-quarters of the plants back into this box with new soil and enjoy another two years of plentiful chives. The other pieces can be potted into other containers for you or your friends. If these are grown in the ground they need about a square foot of soil, two if you have it. Chives growing in the garden need never be disturbed. 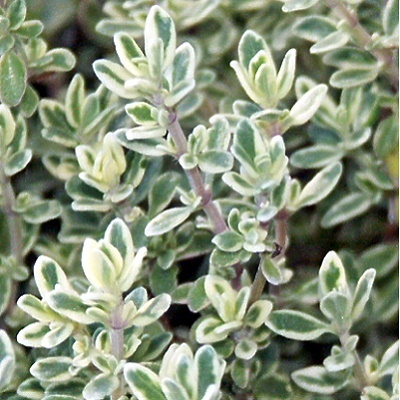 Italian Oregano is a cross between Oregano and Marjoram. Most oreganos are big bushes or creeping plants. Italian Oregano grows as a small shrub which makes it perfect for smaller spaces. In the garden it needs about two square feet at maturity. Plant Italian Oregano in a well drained sunny spot. Harvest often to keep growth lush. It flowers in summer and should be cut back several inches after flowering. If grown in a container, Italian Oregano will need to be moved from its gallon to a larger container after the first full growing season. Blue Boy Rosemary is the shortest rosemary with the smallest leaf but the flavor packs that familiar piney rosemary punch. 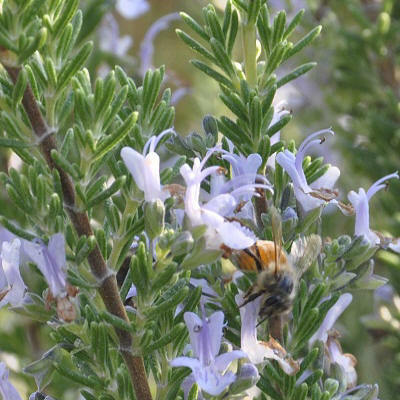 Blue Boy Rosemary grows best in well draining soil in full sun. It will be only about two feet in diameter after four or five years which makes it great for a small space. Be sure to trim up branches that lay on the ground so they do not root which causes the plant to grow wider. In containers, choose a soil with plenty of chunky material like perlite or little lava rocks. Drainage is key for all rosemary. 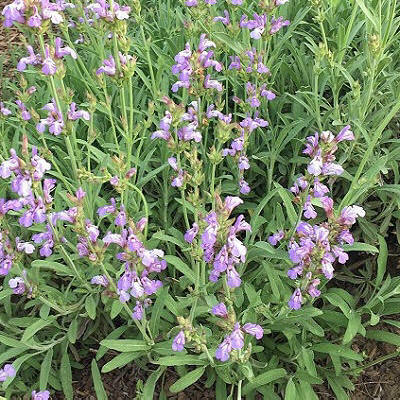 Window Box Garden Sage is a Mountain Valley Growers introduction. It sprouted from a batch of regular Garden Sage seed planted two decades ago. It can be used in any recipe calling for Sage. Window Box Garden Sage rarely gets over a foot tall but can spread if its stem is allowed to lay on the ground and root. Keeping it trimmed up will keep its use of space to about a foot or two at most. It flowers in early spring and is covered with short stems of bright violet. In a container, start with a gallon of soil and check the following spring to make sure it is not root bound. Winter Savory is a small-leaved herb with a great big punch of flavor. It rarely gets over a foot or so wide and high. As with all the herbs in this garden, Winter Savory likes full sun and great drainage. Like all culinary herbs, leaves are best harvested before flowers appear. Winter Savory with its slightly spicy flavor combines well with all Mediterranean herbs. If grown in a container, a gallon size pot should last about two growing seasons before it needs a larger pot. 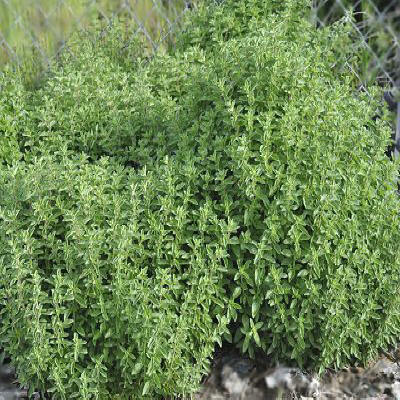 Hi-Ho Silver Thyme is a culinary garden thyme with a flavor like English Thyme. The radiant illuminating leaves make this thyme a garden stand out. If planting in the ground, place in front of taller plants. Because all thymes will creep if their stems touch the ground and root, it is necessary to keep it pruned up if space is an issue. 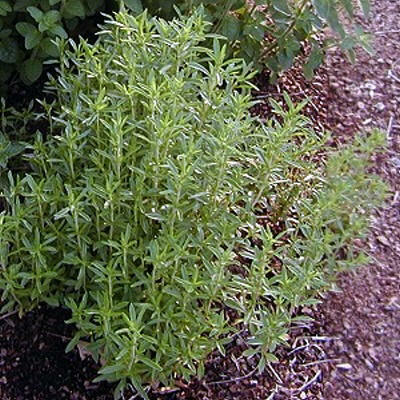 With proper pruning, Hi-Ho Silver Thyme should stay about 1 to 2 feet in diameter. If planting in a container, choose a well draining potting soil and give each plant a gallon of soil to start with. In a year or so, check to see if the roots are filling the container. If so, move up to a larger container. Includes the six plants above. Includes the six plants above and the book Container Gardening by Stephanie Donaldson. Plant substitutions are made when necessary with similar varieties. Books are never changed. Additional Small Space Culinary Herbs: Garlic Chives, French Tarragon, Dill, Chicory, Cilantro, Chomley Farran or Clove Pink Dianthus (edible flowers only), Jean Davis Lavender, German Chamomile, Mint (containers only), Sweet Basil, Stevia, Lemon Thyme, English Thyme, Italian Oregano Thyme and Orange Balsam Thyme.